While driving across Crystal Springs Lake on the way to Half Moon Bay via Hwy 92, this little boat house has always captured my attention. As a little kid I wondered about the dock and what purpose it served since you weren’t allowed anywhere near this lake. Crystal Springs Lake was created as an emergency water source for San Francisco in the event that “The Big One” caused enough catastrophic damage to the Hetch Hetchy Aqueduct that we couldn’t get fresh water. 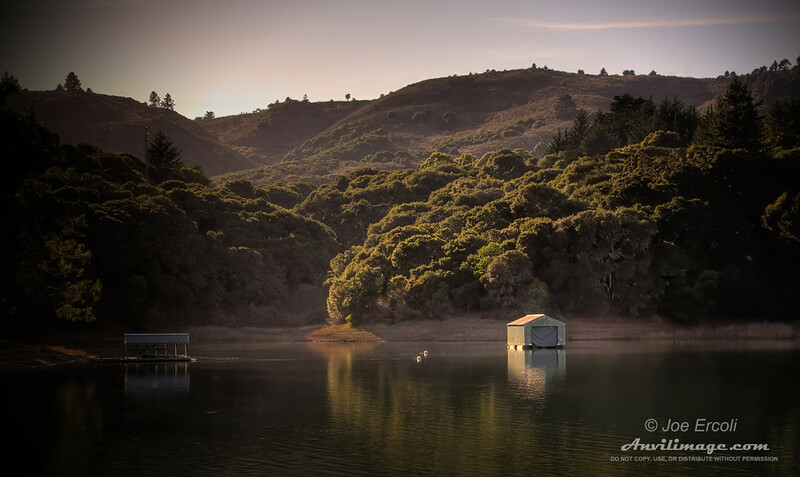 This entry was posted on Saturday, February 28th, 2009 at 12:01 am	and is filed under Blog, Photos and tagged with boat house, crystal springs, golden pond, half moon bay, HDR, lake, reflection, SF Water Department, sunset. You can follow any responses to this entry through the RSS 2.0 feed.